Knowing how to take it easy is key when it comes to a rich and well-rounded life in these days and times. In fact, many people are realizing that getting ample downtime makes all those times when you’re “on” that much more sane and productive. Besides, it just plain feels good!! But, do you ever say to yourself, “I’ll finally be able to relax when….the kids go off to college, we go on vacation, when I retire, or even, when I die”? If so, you could probably use some strengthening of your Power of Relaxation. You’re constantly rushing around, feeling pressed and pressured. You go through the whole day without stopping, resting, or breathing deeply. You’re wound so tight that you’re snapping at your spouse and kids for the smallest things. You cram a week’s worth of things to do into one day. You feel overwhelmed with all the places you need to be and all the things you think are expected of you. put your feet up, and take it easy! ‘How am I supposed to find time to relax,’ you wonder? If you strengthen this Power inside yourself, it will come more easily. ‘I’ll relax when I’m dead,’ you say? Well, you’ll be dead a lot sooner with that mantra! This is critical…and not just something to save for your vacations! You’ve gotta access your Power of Relaxation every day or that nasty little bugger, Stress, will chew your life up into little bitty bits, and it won’t be pretty! We’ve gotten pretty good at working the Power of Relaxation into our everyday lives. We took pillows, water, and a juicy novel out to the green hammock in the garden and lay down facing each other (it’s a double wide). We took turns reading out loud for a few hours until the sun got too hot. Then, we put our shoes on, collected our pillows and things, and trudged our way around the back of the house where we have a blue hammock in the woods. Can you believe it? We had to lug our own pillows! We had to walk on our own two legs at least 50 yards! 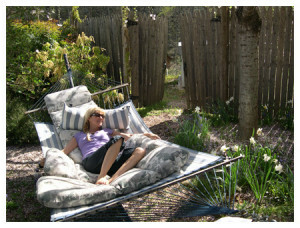 It was such a painstaking experience that we laid in the blue hammock in the shade for another 3 hours reading! I’m telling you, it was ROUGH! No really, it was an incredible Mocha experience. Deeply relaxing, as if all our cells just melted with each swing of the hammock and any stress floated away on the breeze. It was such a renewal of our Powers of Relaxation that ever since then, we’ve been reading and hammocking for smaller amounts of time, but more regularly. Feelings of pressure will fade and you’ll move through your day with the extra space and time to draw a nice deep breath, and soak up the goodness of life. Instead of rushing, you’ll ease through your day in ‘relaxed action’, leaving you feeling accomplished and peaceful instead of exhausted and frazzled. You’ll get all the R & R you need. With your nerves soothed instead of frayed, you won’t feel so trigger happy with your family. You will hit the high spots, take care of what’s necessary, but not overdo it. It will be easier to not sweat the small stuff. You’ll put your sanity and health before your drive to do it all, without feeling guilty. You will be able to simplify your life, your space, your calendar, and your to-do list, creating more room for decompression. “Less is more” will make perfect sense. Stop the world and get off for a spell.